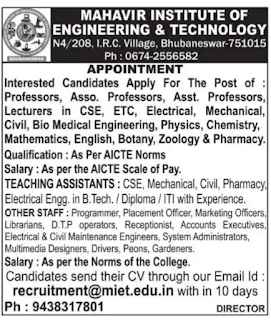 Mahavir Institute of Engineering and Technology, Bhubaneswar has advertised in the Sambad newspaper for recruitment of Teaching Faculty- Lecturer, Assistant Professor, Associate Professor,Non Teaching Faculty jobs vacancies. Interested and eligible job aspirants are requested to apply with in 10 days. Check out further more details below. Name of the College : Mahavir Institute of Engineering and Technology, Bhubaneswar. About College: At MIET we are passionate about grooming leaders who are not only thorough professionals but also good human beings with values and cultures. This is just one of the many reasons given below, why we are consistently top ranker. As per norms of the college. 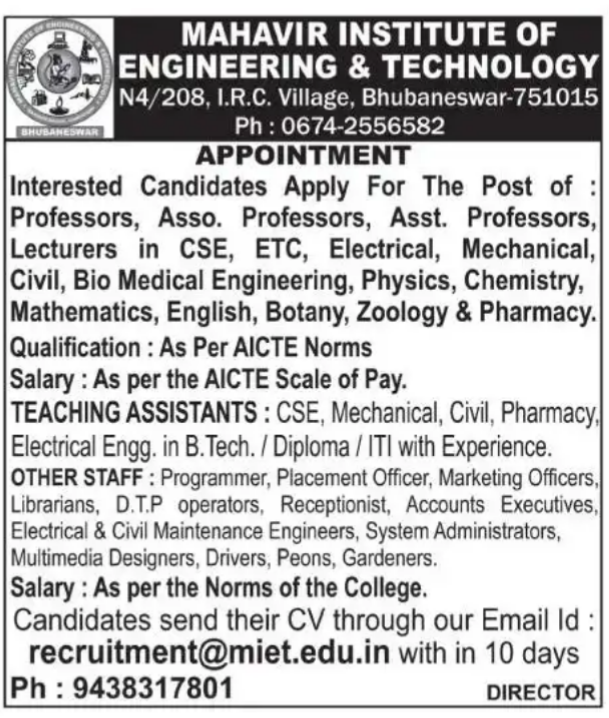 Reference: Recruitment Notification / Career Job Opportunities notice for Teaching Faculty - Lecturer, Assistant Professor, Associate Professor, non teaching faculty on Sambad newspaper Dated 2nd July 2018.